Your favorite marsupial, Crash Bandicoot, is back! He's enhanced, entranced & ready-to-dance with the Crash Bandicoot N. Sane Game & Controller Bundle for the Nintendo Switch. 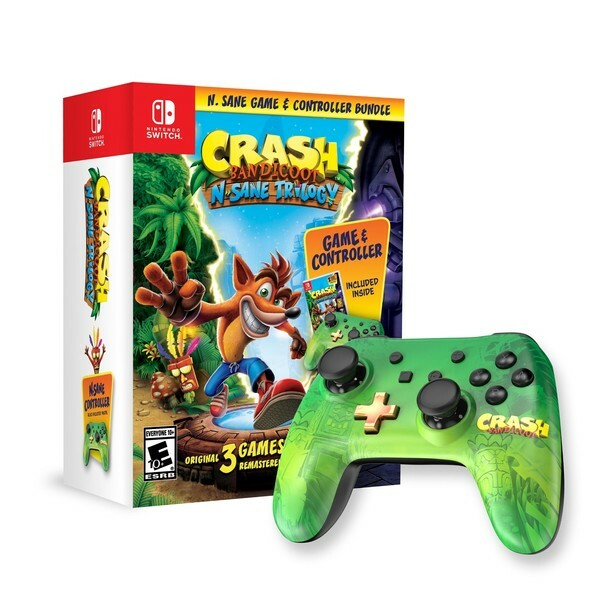 Includes the Crash Bandicoot N. Sane Trilogy game collection and themed PowerA Wired Controller. This controller lets you spin, jump, and wump in style as you take on the epic challenges and adventures through the three Crash games that started it all, Crash Bandicoot, Crash Bandicoot 2: Cortex Strikes Back and Crash Bandicoot: Warped. Are these games any good? Yes. I will say that the original is hard to get used to. You’re basically jumping on an invisible grid and it’s hard to determine your spatial awareness. So basically you’ll jump and have a hard time knowing if you’re going to live or die. It’s a bit frustrating. Otherwise, they are pretty fun games. Cool man thanks, good to know.